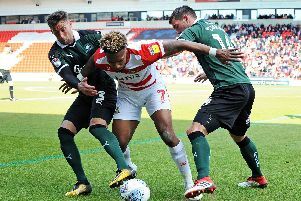 Doncaster Rovers centre back Joe Wright wants points and not plaudits. Rovers impressed against Sunderland last week and dominated the second half at Coventry City last time out – but ended up losing both games. And Wright, who netted his second goal of the season in Saturday’s 2-1 defeat at the Ricoh Arena, does not want that pattern to continue at Charlton Athletic this weekend. “It’s more of a kick in the teeth whenever you come away from places and teams say ‘you’re a good team’ and all this lot,” he told The Star. “But at the end of the day we’ve lost and we came away with nothing. “It was a bit of a learning curve on Saturday and we can’t do that again. “We have to play like we’re capable of playing - like we did in the second half – to hit the targets we’ve set at this club. “We probably feel the results over the last few weeks haven’t matched up with the performances,” he added. Rovers have won just one of their last six games in League One but still sit eighth in the table and are just two points adrift of the play-off positions. “It’s a tight league and the table shows that at the moment,” said Wright. Niall Mason and Andy Butler will return to the side this weekend after serving one-game bans at the weekend.